Just the other day on twitter Sam Fack shared some pictures of a track he built for his Cinemover. I’ve been looking for something like this myself and was quite impressed with it. 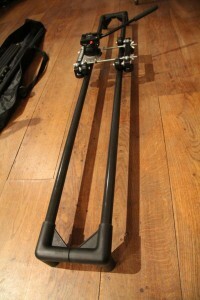 It looks like something that could easily be used with a couple light stands or tripods. Great job Sam! Check out his tutorial below and a some footage he shot using it. Well this is the first time for me being on the wrong side of the lens, so apologies for being slightly out of focus all the time. This is a short video on a track that I made for a Cinemover (links below). The track is made up of System 30. It’s a really useful resource as you can pretty much make anything frame based that you could think of. By the way, here’s another little tech tip: If you’re looking for 15mm rods for a support rig, try sport kite builders and suppliers. They usually have several sizes of fiberglass and carbon fiber rods, and tend to be a LOT cheaper than camera supply houses. Would plastic plumbing wastepipe and fittings in 32mm width be any good for this? It would cost about £5 to make a 3 meter track out of plumbing stuff..